God's blessing be upon you! There is no other duty more binding on you than the quest of the Real One. If you go to the bazaar, seek Him! If you enter your house, seek Him! If you go to the tavern, seek Him! I was in a tavern, and so too was my Friend: He came to me in private prayer, bearing a goblet of wine! If the angel of death, Azrael, come to you, becareful not to desist from seeking Him! Say to Azrael: "You do your work and I'll do mine." Except for Your name, nothing will be found in my record. Imagine the power of few correspondences in form of letters during the medieval period between two persons, which were so rich in their content that the letters were copied by seekers of truth, was kept as prized possession by kings and rulers and were made compulsory text in religious schools (madrasas), where the letters were not only read but fractionally memorized as part of the religious, spiritual education. These letters after compiled became known as The Hundred Letters and were written by a celebrated saint of Bengal, Sharafuddin Maneri (1263 - 1381). The Hundred Letters was prized among all the sufi circles of medieval India. Known by the title "The spiritual Teacher of the Realm", Sharafuddin Maneri, may God be pleased with him, is venerated as one of the most famous Islamic saints (awliya Allah) and sufi master. The then governor of Chausa, Bihar (northeast India), Qazi Shamsuddin frequently petitioned the spiritual master Sharafuddin Maneri to send him written instructions for his spiritual advancement; as the governor job and his many responsibilities prevented him from attending the audiences to the saint. Sharafuddin compiled with Qazi's request, writing him a number of letters on various spiritual topics throughout a year around 1346, 1347. They were later copied by Zain Badr Arabi. Soon The Hundred Letters gained fame beyond as well as within the sufi circles of Bihar. The English translation done by Paul Jackson of the Hundred Letters are a wonderful read. Praise be to God, I recently obtained a copy and I cannot recommend a book higher than this one. The quality of the letters in terms of their subject matter and the art of transmitting spiritual advice/ insight are quite extra-ordinary. 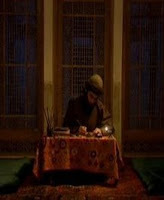 Dr. Bruce Lawrence in his Foreword says of the letters, "they are unrivaled ... and cannot be surpassed .. as an invitation to experience the Sufi Way as a Sufi Master experienced and described it, to join him in the endless struggle which has been ordained for man alone in the whole created order, to seek perfection while clinging to the pain of love." This book is by no means just abstraction and talking about ideas but infused with valuable guidelines, insights, well laid out examples that unveils many mysteries with simple parables and recommendations for every seekers of Truth in Sufi path, the path of purification and love. I quote portions from few letters and this is an injustice because each letters can only be tasted in its fullness as well as in their flow; one letter sometime carries over the previous ones, yet each has its greatness by its own. These quotes are just a random taste of this great treasure house which this book is. .. in the fourth stage (of the belief in the Unity of God), such a surfeit of the dazzling divine light becomes manifest to the pilgrim that every single existing particle that lies within his vision becomes concealed in the very luster of that light just as particles in the air are lost to sight on account of the brightness of the light emanating from the sun. This occurs not because the particles have ceased to exist but rather because the intensity of the sunlight makes it impossible that anything other than this concealment should exist. In the same say, it is not true that a person becomes God - for God is infinitely greater than any man - nor has the person really cease to exist, for ceasing to exist is one thing, and becoming lost to view quite another! Everything is nothing, nothing at all! Yet He is what He is. How then can we remain separate from You! When "I" and the "You" have passed away, God alone will remain! When you look into a mirror you do not see the mirror for the simple reason that your attention has become riveted on your own handsome reflection. You would not, however, go on to say that the mirror has ceased to exist, or that it has become beautiful, or that beauty has become a mirror. In a similar fashion, one can contemplate at God's almighty power in the whole gamut of creation, without any distinction. Sufis describe this state that of being entirely lost to oneself in contemplating of the Unique Being! "His very brilliance blinds me to whatever descends!" .. the friendship of the Lord Most High for a servant is something hidden. When a servant wants to know whether he is one of God's friends or not, let him seek the confirmation of some signs of this love. .. It is a risky business to claim that one loves God! The reason for this has been well put by Khwaja Fuzail: "If someone asks, 'Do you love God?' remain silent. For if you reply in negative, that would be infidelity; while if you reply that you do, you would be lacking a quality of lovers, and your love would be in danger!" Understand that anyone who claims that he loves does the easiest thing in the world, but actual loving, ah! that is extremely difficult! The treasury of the King is found in the heart. Look carefully to see what you have in this treasury! If it is filled with gold and gems, then it is indeed a treasury! If it is full of straw and refuse, then it is a mere rubbish dump. One treasure is said to be in heaven, and consists of the blessings of paradise. .. The keeper of treasure of paradise is an angel called "Rizwan", but the keeper of the treasury of love is the Lord Himself. Your true reality is that which is within your breast. A man is where his heart is! [>] Partially the book can be accessed and read via Google Book. Sharafuddin Maneri was born in August of 1263, at Maner, Bihar - a state adjacent to Bengal in northeast India circa. His father, a famous Sufi saint in his times, was named Yahya. Henec the full name of the saint is Sharafuddin Ahmad ibn Yahya Maneri. Because of his great spiritual status he became known as Makhudm al-Mulk or "The Spiritual Master of the Realm", and people still in Bihar simply refer to him as Makhdum Sahib. He lived a considerable portion of his life in Sonargaon, near modern day Dhaka in Bangladesh. His major spiritual guide was Najibuddin Firdausi (of the Firdausi Sufi order). The saint spent last forty years of his life in Bihar where he passed away in January 2nd of 1381 and his death anniversary is still celebrated every year. Many sufi orders came to Bihar, such as Chishti, the Shattari, the Qadiri and the Naqshbandi. But Makhdum al-Mulk, Sharafuddin Maneri eclipsed the leaders of all these orders. He still enjoys immense popularity among Hindus as well as Muslims, a tribute that has been denied to other medieval Sufi mastes and that explains the popularity of the order he introduced to Bihar, the Ferdausiya. - from the Preface of The Hundred Letters. Invoking by the blessings of al-Fatiha, may God sanctify the perfumed soul of Makhdum al-Mulk Shaykh Sharafuddin Maneri, God be pleased with him and connect us to his spiritual station.